The tiny, isolated fishing village of Large Mouth never saw much excitement — until the arrival of the stranger, that is. Wrapped from head to toe in bandages and wearing weird goggles, he quietly took up residence in the sleepy town's motel. Driven by curiosity, the town folk quickly learn the tragic story of his past, and of the terrible accident that left him horribly disfigured. Eventually, the town embraces the stranger as one of their own — but do his bandages hide more than just scars? Inspired by H.G. 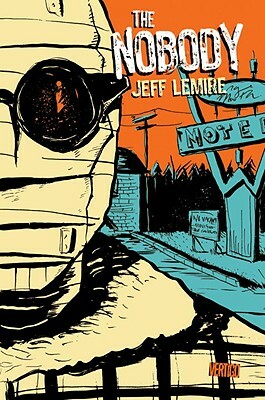 Wells' The Invisible Man, The Nobody explores themes of identity, fear and paranoia in a small community from up-and-coming alternative comics creator and Xeric Award-winner Jeff Lemire (The Essex County Trilogy) in a special two-color story that'll have you guessing until the very end. The tiny, isolated fising village of Large Mouth never saw much excitement -- until the arrival of the stranger, that is. Wrapped from head to toe in bandages and wearing weird goggles, he quietly took up residence in the sleepy town's motel.Driven by curiousity, the townfolk quickly learn the tragic story of his past, and of the terrible accident that left him horribly disfigured. Eventually, the town embraces the stranger as one of their own -- but do his bandages hide more than just scars?